This Baked Pork Chops with Rice dish is very popular and well-liked in Hong Kong. The melted cheese covering tasty pan-fried pork chops on a bed of fried rice makes everyone enjoy digging in. This Baked Pork Chops with Fried Rice (焗豬扒飯) is a classic Cantonese cuisine that I started to eat when I was a little kid. Even though my lovely daughter has adapted to Western foods, she loves this dish very much. Whenever we go into any Chinese café (茶餐廳 Cha Chaan Teng ), she would definitely order this dish. She’d never miss it at any time. If you’ve tried this dish before, I think you would share the same feeling that this classic Chinese cuisine is very tempting. This time I added some fresh mushrooms that most Hong Kong restaurants seldom use because fresh mushrooms are very expensive in Hong Kong. 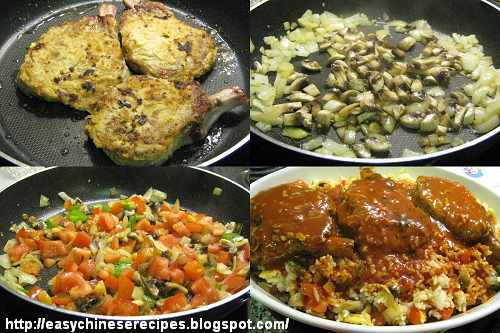 After stir-frying the mushrooms with other vegetables, I cooked the delicious tomato sauce. 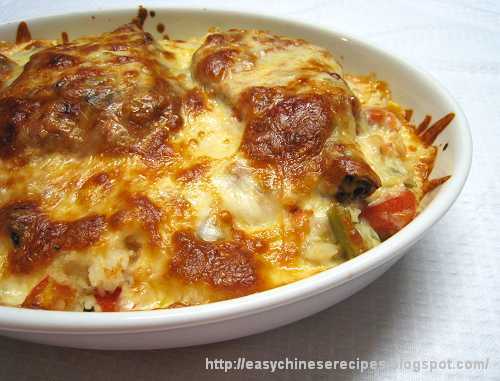 The special part of this dish is the fried rice with the baked loin chops and melted cheese on top. When it comes out from the oven, both the flavor and color of the dish are very attractive. Rinse and wipe dry pork chops. Use the back of a chopper to tenderize them. Mix well with marinade and leave for 30 minutes. Separate a small part of whisked eggs for dipping pork chops and leave the rest for frying rice. After dipping the pork chops thoroughly in beaten eggs, pat lightly with plain flour removing excess flour. Put pork chops in a frying pan over high heat until both sides are brown. Set aside. Add 2 tablespoons of cooking oil to sauté onion until aromatic, add minced garlic. Toss in mushrooms and leave them to cook until dry. Add green, red capsicum and tomatoes, liberally sprinkle salt. Stir well until all ingredients tenderized. Set aside. Add oil in frying pan, pour in the rest beaten eggs. When the eggs cooked half through, toss in white rice, stir well. (See details of how to fry yummy rice.) Stir in 2/3 cooked vegetables, arrange in a ceramic tray (oven proof). Heat up the pan again, sauté minced garlic over medium low heat. Add tomato paste, chicken broth. Gradually add plain flour to thicken the sauce, sprinkling salt and sugar to your taste. Toss in pork chops and the rest of vegetables. Place sauce mixture over fried rice. Bake in the oven at 220C for about 15 to 20 minutes, or until cheese turns golden. Once the cheese is melted in oven, the dish is done. Don’t need to bake too long as all the ingredients are already cooked through. This looks like no Asian dish I have ever eaten or seen in a restaurant...but it looks so delicious, I'm going to try it. This dish is very common in Hong Kong that has adapted some Western cooking methods in it. It's very delicious! this is my younger daughter's must order, whenever we go to a HK type cafe. will attempt to make it for her this weekend. hopefully it will turn out. That's great. Your younger daughter would be very happy then. I tried this out last week. Didn't look as good as yours, and taste great! My younger daughter was dancing around the oven while it is being baked, so amused that her fav food can be made at home! I'm glad to hear this news. When we see our kids expecting and eating what we cook for them, it's a BIG reward indeed! Oh yeah, can't agree more. I used this recipe for the first time a while ago, it was sooooo successful, not only it looked good but it tasted so good too.....my not so young children were delighted! I didn't expect a homemade baked pork chop fried rice can be that delicious! Thanks for sharing! Yeah, your guess is right. Do you come from Hong Kong as well? Hope you'd have another successful trial next time. Good luck. I cooked this recipe for dinner tonight and it was delicious. I was a bit iffy about putting cheese on but it really made the meal. I used an equal amount of tasty and mozzarella and dusted it with Parmesan. Next time i am going to try the meal with diced pork instead and put in some diced bacon and panchetta. I found the fried rice baked with Mozzarella and Parmesan on top is the star of this dish. Pretty good idea of trying diced pork and diced bacon. Hmm...I'd like to try as well. Hi Christine! I just made this tonight with 4 pork chops and it was great!!! Very flavorful but I just wished there was more sauce. I also used ketchup instead of the tomato paste since that's all I had at home! Thanks for sharing this recipe! keep a packet of tomato soup powder in your cupboard. Easy to create tomato past by adding enough water to get the right consistency. As an ex casterer I know that they use tomato powder to make everything from tomato juice through to soup, to tom paste. It's a much easier method, and cheaper too. i just made this the other day! this was one of my favorite hk cafe dishes too! Go fellow hong-kongers! Hi Christine, I am going to make this tonight, wanted to make for a long time and finally today : ) Miss the ones in HK Cha Chan Teen. Quick a lot of work but sure it's worth it. You'll like it. I also miss those ones in HK. Christine, thanks for the recipe. This is a favourite at many cha chan tengs that I go to and now I can make it at home! I added canned (evaporated) milk to the sauce mix and found that more to my liking and a bit more like the places around here. this is the best thing on the menu in fairwood (dai ga lok) in HK! I always only order this there! must try this at home! A chef I knew in HK said the secret to the sauce is to add some cream or condensed milk. This will neutralize the acidic flavor of the tomato sauce. I also find that mixing golden mushroom soup and tomato sauce works pretty well too. My family loved this dish each time we went to Cafe de Coral and Fairwood when we lived in HK. Look forward to trying this version. Hi Christine, many thanks your recipe. Looking at your readers' comments, I'm sorry to say it's ancient, but it's nostalgically welcome I'm sure. Indeed when I was a kid in HK I used to order this dish at a cafe. I noticed in recent years many of them have changed the way they cook it, not really the same. Shame! I went last week to the Bang Bang food centre in Colindale, North London and ordered this dish at one of the food counters. It costed me £7.80, and it's crap, nowhere near yours. I'll try your recipe one day. Many thanks. Couldn't agree more. We hardly find this dish treated justice at most HK cafe nowadays. It's time to try out our homemade version. Let me know how you like it if you try this recipe. I just made this with 6 pork chops the other night and it was absolutely delicious!! I wish I had more sauce though!! Even my picky toddler kept asking for more! Thank you Christine! So glad that your toddler loved this dish. Congrats! I've made this a few times now, get compliments every time, even my father in law likes it and he doesn't even like Chinese food. I love your blog Christine! So glad that your father in law liked it. Thanks for your love of my recipes.